NAZI GERMANY SURRENDER TO THE UNITED STATES ON MAY 7TH, 1945. 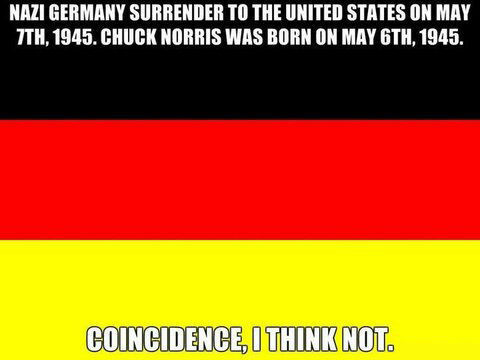 CHUCK NORRIS WAS BORN ON MAY 6TH, 1945. Saulo probably is Brazilian. And he probably doesn't know the name of his country was United States of Brazil up till the Military Coup. Or that Mexico is still United States of Mexico. Or that nobody calls the American Continent just "America".